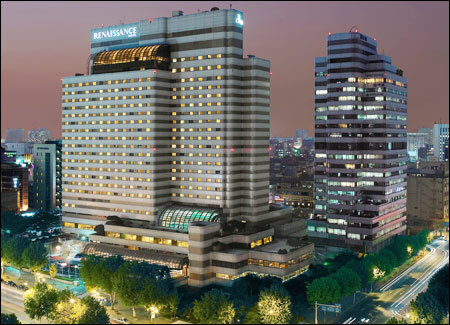 Renaissance Seoul Hotel is located in the heart of the Korean business and financial district of Gangnam, southern Seoul. With top-notch facilities such as shopping centers, airport bus stops, the Korean World Trade Center and the luxury shopping districts of Apgujeong-dong and Cheongdam-dong just around the corner, the hotel offers the best location anyone could ever dream of. Selected as the best Executive hotel, the 493 rooms and event halls in this five-star-hotel have constantly been in the spotlight for new events and facilities introduced to public. There are the presidential suite, best-known as the set for the hit TV drama ``Lovers,'' cozy deluxe rooms, roomy executive rooms and others. A high-end club lounge is at the 19th to 22nd floor, providing exclusive check-in and check-out services and beverages and cookies. During ``Happy Hour,'' food from all of Renaissance Seoul Hotel's restaurants is offered. Hotels are not for just sleeping ― Renaissance Seoul knows that. At the recreation center on the fifth floor, the fitness club, swimming pool, sauna and mini-golf course have just been refurbished. The swimming pool's glass dome in particular offers guests the chance to breathe and feel outdoors. The mini-golf course is at the balcony, also bringing an outdoor atmosphere. There are also professional trainers waiting to offer help. Individuals can get brief checkups and customized workout plans. Attendants are also available at rest rooms. Could there be any better way to feel New York than having steaks or strips? The Manhattan Grill, headed by chef Brendan Mahoney, offers top-notch Australian steak, lobsters, oysters, fish and more, attracting many sophisticated clients from around the city. The restaurant won an award in the Continental Food and Beverage category. There are Ultimate Lunch or Chef Special Menu items for people who can't decide. The restaurant offers premium Hanwoo (Korean beef) steak and lobster for December. Those who make reservations for the Christmas special course can get a special dessert served in a chocolate bowl with their names carved on the cover. Apart from the Manhattan Grill, buffet restaurant Cafe Elysee, Chinese restaurant KABIN, Italian TOSCANA, Japanese IRODORI, club HORIZON, Korean restaurant SABIRU, boulangerie The BAKERY and barbeque bar VENDOME all offer state-of-the-art yet classic and comfy foods.